I am soooooo excited! In general, most of the time I find life exciting, so it’s no surprise that among the end of the year stress and overwhelming tasks that need to get finished, I find excitement. It’s simple, it’s my birthday tomorrow and I love my birthday, I am turning thirty five. I am not ashamed to admit, I like celebrating my birthday! Celebrating will happen for one week minimum. In fact, right now I am sitting in a lodge nestled in the woods on the Columbia River. I am sipping coffee, and eating a pastry from my favorite bakery in Portland. A nice quiet weekend among many busy others is a nice treat this year. It is a very good excuse to relax, eat more good food, and celebrate life, because it is one great life! The fun thing is, before I left for this weekends birthday retreat, I made this beautiful organic brown sugar cranberry glazed pork loin for one of my birthday meals. It’s funny, I cook some of my favorite foods, Brian cooks some of them, and so does my Mama. It’s a thing I like to do every year. So on Thursday evening we had this pork loin lathered in a subtly sweet and deep savory sauce made with my most favorite sugar company brown sugar. I have been using Wholesome Sweeteners sugar since they first opened in 2001, so what a treat that we are working together on the blog now for the first time the day before my birthday. I am so blessed and feel grateful for this, it is a great gift! I enjoyed making this recipe because it is really easy to put together but is fancy enough for a holiday gathering. I served it over sauteed lacinto kale and cremini mushrooms with a drizzle of extra sauce. You get a tender, easy to make pork loin perfect for a weeknight meal, or holiday celebration. Now I am off to read in front of a fire, overlooking the woods, and perhaps a walk or bike ride in a bit. They have bikes to ride in the woods here! I feel spoiled, and grateful for all this year has brought. Wholesome Sweeteners offers a huge variety of products that are Organic, Fair Trade, Non-GMO to create a sweeter world. How cool is that? That is exactly why I have been using these products for so many years. They are also doing some generous giveaways for 12 Days of Sweetness Sweepstakes on their Facebook page, so go on over and enter to win up to $1000 in gifts! Place rack in center of oven and preheat to 350 degrees. 1. Pat pork loin dry with paper towel. In a 12 inch oven safe skillet, add olive oil over medium high heat. When oil is shimmering, place pork loin fat side down in pan. Sprinkle liberally with salt and pepper, sear each side for 3 minutes. Remove and place on a plate. 2. Add chicken stock, and orange juice to skillet. Lower heat to medium, using a spoon, scrape the pork bits off the bottom of the pan. 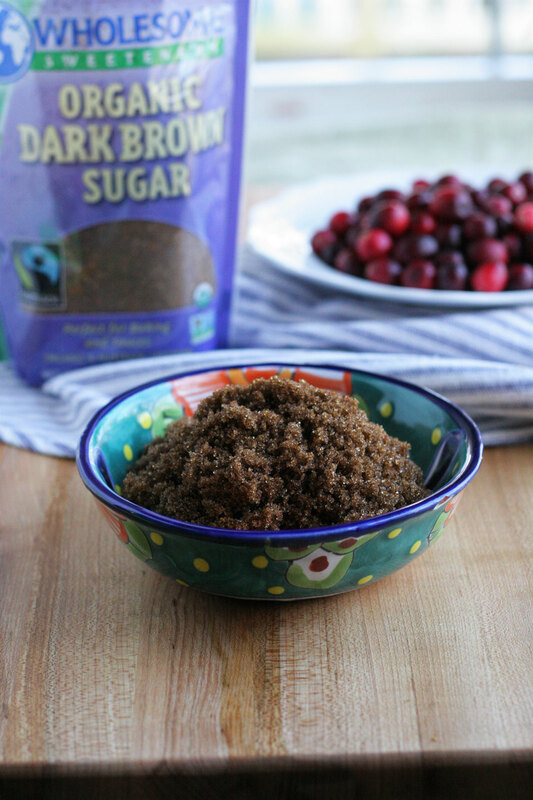 Add cranberries, brown sugar, 1/2 teaspoon salt, and ancho chili powder (optional). Stir frequently, and cook for 15 minutes. Taste sauce for seasoning, add salt and pepper if needed. Place pork loin in skillet. Spoon some of the sauce/glaze over the pork loin. 3. Place skillet in oven for 30-35 minutes, or until internal temperature reads 145 degrees. Remove roast from oven and place a foil tent over the roast. Allow to rest for 15 minutes. Place on cutting board and slice 3/4-1 inch thick. 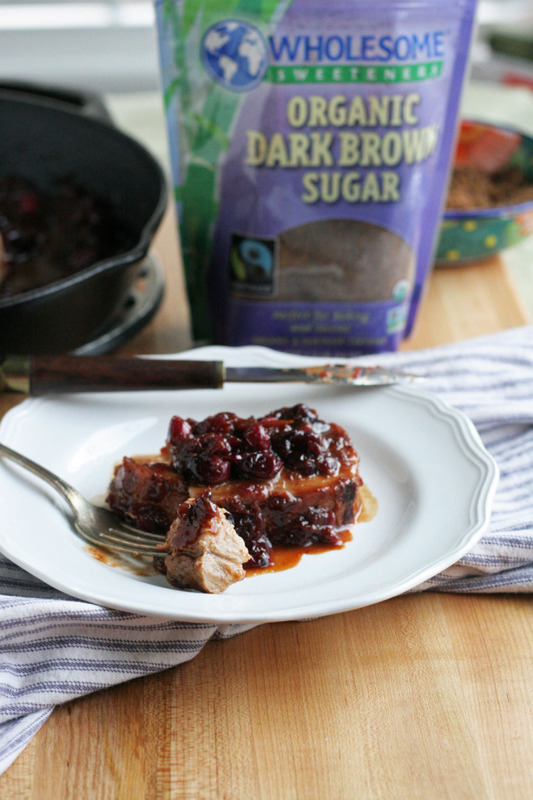 Serve warm with remaining brown sugar cranberry glaze. I hope your birthday was wonderful! Thank you, Aimee. It was perfect! This pork looks great! I LOVE that brown sugar you used. GMO free – sign me up! Thank you!!! Right?!!! I just love this company. 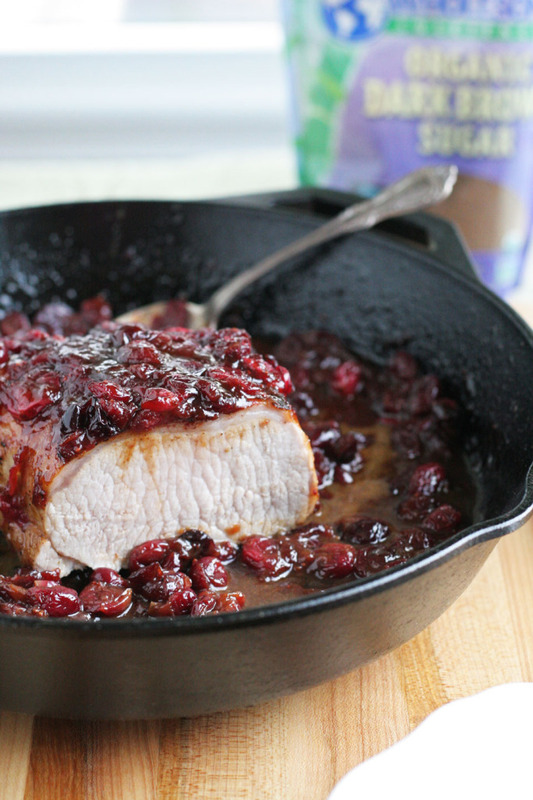 Pork and cranberries = perfect! 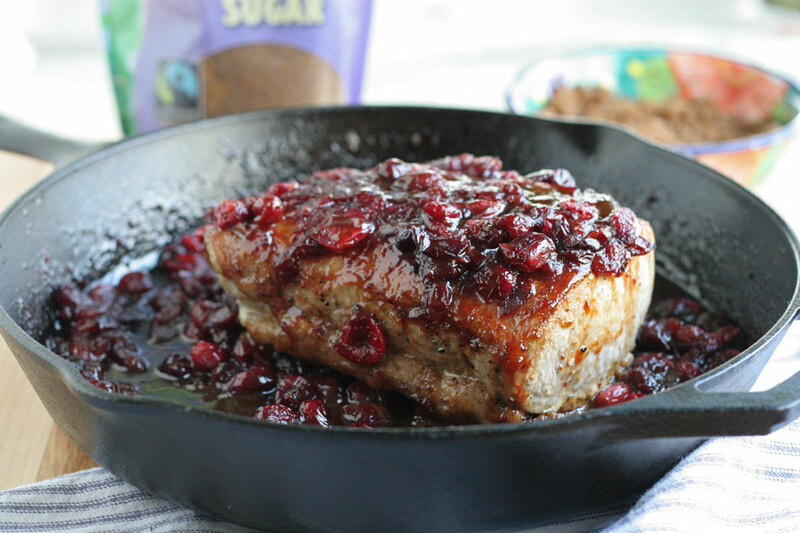 I can’t tell you how much I like this brown sugar cranberry glazed pork loin. Looks and sounds absolutely delish. It’s that sweetness with the pork that so complimentary (like apples).